We offer advanced glaucoma screening and the latest glaucoma treatment Glaucoma is described as an abnormal buildup of pressure inside your eyes. As this detrimental eye disease progresses, it will cause permanent vision loss. When left untreated for a few years, glaucoma can lead to total blindness. At Executive Park Eye Care, our eye doctors will perform a glaucoma test as part of your comprehensive eye exam. During the early stages of the disease, glaucoma symptoms may be absent, and a thorough evaluation of your eye health is the only reliable way to detect the condition. Our Colorado Springs office is equipped with state-of-the-art optometric technology that will diagnose glaucoma accurately. Who is at high risk for Glaucoma? Although increased pressure inside your eye is generally the main indication of glaucoma, there are other glaucoma symptoms that can be detected during an eye exam by our optometrists in Colorado Springs. In addition to a glaucoma test done with specialized equipment, we will also inspect your retina (the light-sensitive tissue at the back of your eye) to screen for this ocular disease and make a firm diagnosis. What happens during a Glaucoma Eye Exam in Colorado Springs, CO? 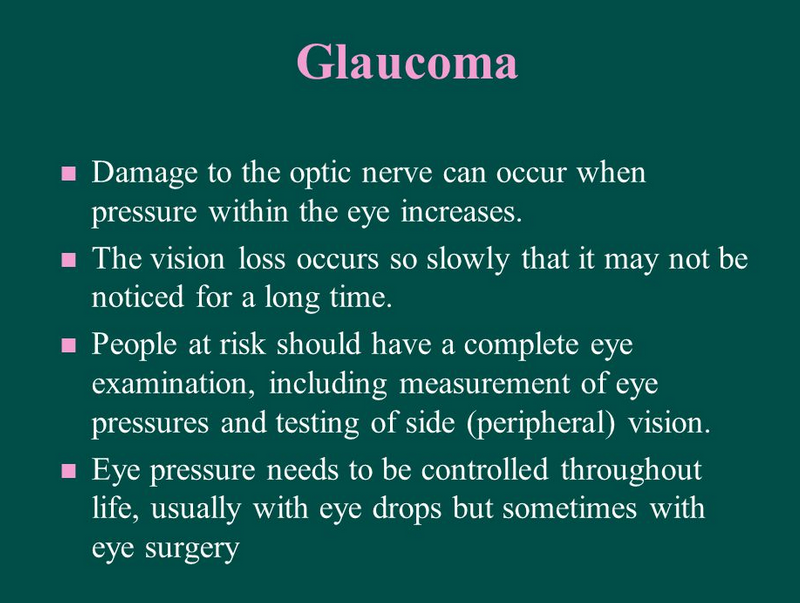 A few different types of testing procedures are currently used to diagnose glaucoma. After your eye is numbed with eye drops, a tonometer is used to measure intraocular pressure (IOP). Either a small probe is placed gently on the surface of your eye, or a puff of air is directed onto your eye to take this measurement. A high IOP result points to a problem with the amount of fluid in your eye, yet this measurement is not always enough to diagnose glaucoma for certain. OCT or other digital imagery instruments are used to create images of your eye’s optic nerve, and then the imaging technique is repeated over time to check for changes. Differences in the images may indicate progressive glaucoma damage to your eye. Are there any Glaucoma Symptoms? Glaucoma usually begins by attacking your peripheral vision, which explains why glaucoma symptoms may not be noticed for a long time. Unfortunately, once you notice vision loss in the center region of your eye, the ocular disease has probably been present for a long while. Only regular, complete eye examinations can identify glaucoma before it gets to this point. For the best preventive care – contact us to schedule your eye exam and glaucoma test in our optometry practice in Colorado Springs. What are some Glaucoma Treatments offered by eye doctors in Colorado Springs? The current goal of all glaucoma treatments is to lower or stabilize the pressure in your eye, which will hopefully prevent damage to your optic nerve. The first line of defense is typically medicated eye drops. Depending upon how far the disease has progressed, other glaucoma treatments include conventional (bladed) surgery, laser procedures or a combination of all of the above. If you are prescribed eye drops, it’s critical to continue taking them regularly and not to become negligent about it. Discontinuing your eye drops may lead to vision loss.